Alongside our extensive product range, we can provide a wide variety of other services in relation to the instruments we sell and music matters in general. Our custom install service is, as the wording would suggest, completely tailored to the clients’ requirements. We are fastidious in ensuring that all installs are done as neatly and efficiently as possible. Only the very best audio equipment is used and we make every effort to provide the most effective speaker positioning. Tonal finishing is given the highest priority. We provide a full spectrum repair and maintenance service – from emergency call outs to overhauling the console furniture. We are fortunate enough to have access to a wide array of talented people in various fields of work and as such can offer a many bespoke services. Audio system upgrades are a relatively common request. Upgrading a speaker setup can be massively beneficial to overall sound of a digital organ. Space and cost being the only true limit on the number of speakers that we can install. All the speakers we use are Viscount approved, and the premium line are custom built to suit the four main sound families (diapasons, strings, flutes, and reeds). We understand that advice and guidance is often what is most required. Our extensive knowledge base on digital organs, pipe organs, audio setups, choral music and liturgy gives us a strong position from which to provide consultancy. 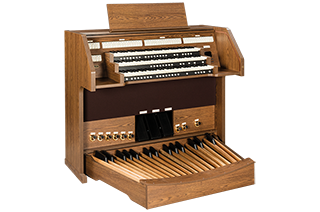 As we often work closely with professional organists in various ways it allows us to call upon their services when required. Please get in touch with us should you need such an organist for an event, recital, church service, wedding or funeral.